2 by 3 Heroes: Tracking the card: two from three? Hopefully everyone had a safe and enjoyable Christmas. I have one more giveaway still in progress until the end of the year, so please take part if you like. It's free. Are their two better words than that? Two words together that are better? You're so cute! Anyway, over the past week I finally took the time to organize a box of junk wax I ripped from my LCS. 1992 Upper Deck baseball high series. The early, bordered UD releases are nice, and the box was just $12. There are Bench and Morgan autos in the boxes, but I didn't pull any. On the plus side, I filled a ton of holes and almost completed the set, so that's a good thing. 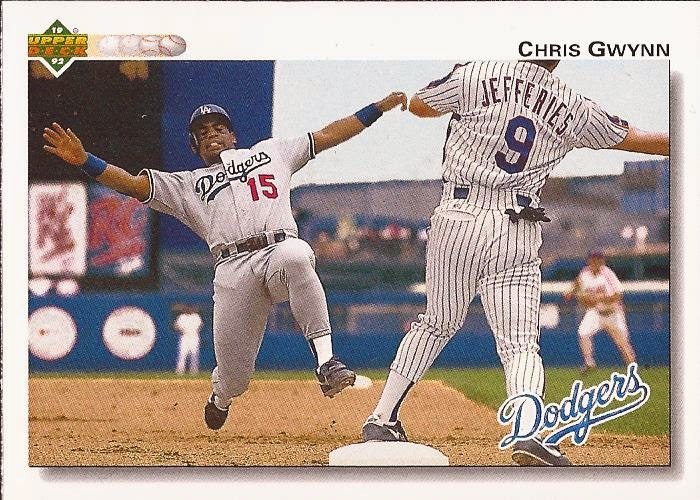 While sorting the cards, I came across this one - Chris Gwynn #689. Another great photo selection from UD. But as you can see, thrid baseman Greg Jeffreies appears to be throwing the bal towards second baseman Keith Miller. Is this a rare DP card that starts at third? Let's sleuth it out. For starters, I am not familiar with Shea Stadium. And a bunch of searches only turned up more recent photos of the park with different outfield wall looks to them. While the stadium does appear to be Shea, there is always the chance it wasn't. The Mets website also has an interactive 360 view of the field, and I was still pointing to this being Shea, but none of the angles confirmed it for me. I needed to be over 50-50 on where this play at third occurred. A search at AP Images got me something that tipped the scales in the direction I needed. This image of Deion Sander and Bobby Bonilla give enough of a view of the outfield wall at Shea to state this is a regular season game. So let's look at the 1991 season for the Dodgers. They made two east coast trips and played a total of six games in the Mets' ballpark. The first two games were in Early May - 7th and the 8th. Chris Gwynn appeared in neither. Their 2nd trip was the end of a 11 game home stand for the Mets, playing 4 games from July 18-21. Chris did not play in the 2nd game on the 19th. He started in left on the other three games. In the game on the 18th, He came to bat 5 times and recorded a single hit - a home run in the top of the 7th. Otherwise, he flew out twice, stuck out once and grounded out 4-3 in his out plate appearances. In the game on the 20th, Gwynn only has 3 at bats, two ground outs and a strike out in the top of the 5th. In the bottom of the 5th, Gwynn was part of a double switch. Tim Crews replaced him in left while Mitch Webster replaced reliever pitcher Dennis Cook, flopping the batting position of the two positional players. That leaves us with the final game of the series on the 21st. Chris came to bat 4 times. He walked in the 3rd and was part of a 6-4-3 double play hit by Lenny Harris. Gwynn hit into a 6-3 ground out in the 6th. In his last at bat, he flew out to his counterpart in left field. It's his at bat in the top of the 2nd that brings our answer. After Darryl Strawberry singled, Gwynn drew a walk. Lenny Harris then drilled a single, scoring Strawberry with Gwynn pulling up at second. Next batter was catcher and current Angels manager Mike Scioscia, who slapped a slow roller to Jefferies at 3rd. Gregg stepped on third for the force, and then attempted a play at second, but Harris beat the throw to the bag. As you look at the card, you can see how close to the bag Gwynn was as Jefferies was making the throw to second. Scioscia was swinging on a 1-0 count, so doubtful it was an attempted steal of third but a slow grounder. Considering it was Lenny Harris advancing to 2nd but Mike Scioscia lumbering down the line to first, I'm shocked Jefferies was throwing for the force at 2nd to get a second out. And with that, we close another case for Encyclopedia 2x3Heroes. I enjoy these breakdowns a lot. They are similar to some of the photo breakdowns that appeared in the SABR Journals from time to time when I was a member of SABR back 10 years ago.